Red Candy revels in the ridiculous. If it’s unusual, slightly weird, a little bit kooky, WE WANT IT. Indulging in this love of the not-so-normal is something we do quite well. With this being said, Red Candy has discovered a brand that encapsulates peculiarity with absolute ease. Seletti! This Italian décor brand is barmy, bonkers and brilliant! Designs that defy imagination and social convention. They are leaps and bounds ahead of everybody else in the game. Red Candy thought it would be an excellent time to bring you a selection of our favourite Seletti products. Here is a handful of our most favourite items! The Seletti Love in Bloom Vase appears to be décor design by doctors. A quite literal representation of the human heart with a primary use of presenting flowers. This particular piece is true genius. The type of piece for a brave and daring soul who doesn’t even play by their OWN rules, let alone societies. This beautiful vase is a piece we’re super excited to stock! This prehistoric lamp looks like something only a mad scientist could concoct. Glowing bulbs run down the spine of the Carnivorous creature, illuminating the path between him and his next meal… Perhaps it’s you? Gorgeous, lifelike resin is used to create the creature, giving the rex additional texture and detail. This lamp is sure to add an enticing glow to your room, and perhaps it’s silhouette might scare off intruders! Seletti isn’t all silliness and button pushing. They also have a real tenacity for making beautiful and inspiring pieces of décor that are sure to speak to your inner explorer. 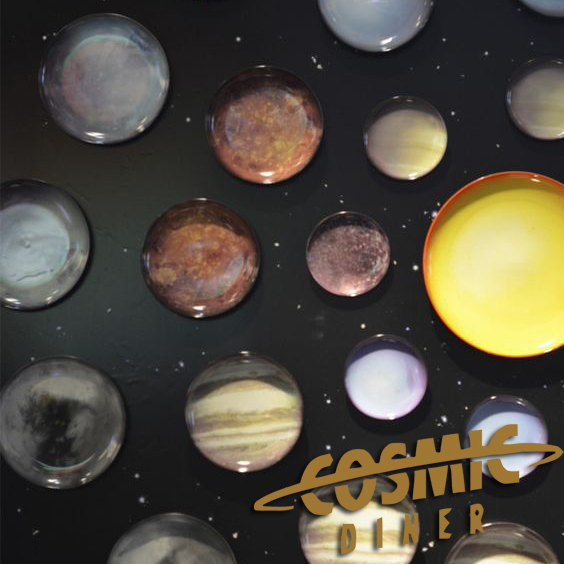 The Cosmic Diner range by Seletti is my personal favourite. Porcelain Plates inspired by the solar system are the real stars of this range. From the Sun all the way to Pluto, Seletti have it covered. Each plate features a real telescopic photograph of each planet printed perfectly on its face. And of course, complementing the range of Planet plates Is the absolute wonderful Starman. A collaborative piece by Seletti and diesel, this Starman is a porcelain vase that can’t help but make you stare in awe. Bringing peace and love across the galaxy, the Starman is the world’s greatest explorer. Encapsulating the twinkle-eyed wonder of the millions of young children who wanted to be spacemen when they grew up (I think a handful of those children may have ended designers at Seletti), This piece speaks to the greatness of human achievement and the path we still have left to follow. For the snap happy and creatives who are obsessed with capturing every moment, the Seletti Camera Vase is a unique little container that is perfect for holding flowers and would even be great as a desk tidy. This amazing approach to design is what makes Seletti masters of their field. Taking a random item, casting it in concrete and repurposing it is all in a day’s work for the Italian company that is ahead of the curve. Ahoy there matey! This approach to design is completely unmatched. Nautical inspired bathroom accessories seem almost obvious in retrospect, with Seletti showing their unmatched reputation at setting trends. This accessory set is essentially an all in one storage unit that can be grouped together or separated depending on your choice of arrangement. Nuclear submarine inspired home décor appears to be few and far between, so thank you to Seletti for bringing us a bit of Red October in… Well, November. Win a shopping spree with Red Candy & Umbra!